Design Wise, indeed. Glad to see beloved HGTV Designer Vern Yip agrees with me in his bestselling new book, Design Wise: Your Smart Guide to a Beautiful Home! Ginger Hartford congratulates Vern Yip - the epitome of a gentleman as a kind, humble and humorous Designer! All kidding aside; as a career veteran of the art industry, I’ve long taught CEU programs about Designing with Art & Framing specifically for residential and commercial Designers. I’m pretty passionate about the art of design as relates to styling with art & framing. Here on my Artful Living Blog, I’ll countdown my TOP 10 ARTFUL DISPLAY TIPS! Ideally, framed artwork is hung with the center at average eye-level, typically 60”. Why 60”? That’s the average eye level for most people, so now you can keep your eye on design like a Pro! Consider how you view artwork whether seated or from a distance, looking across the room as you walk in. It’s helpful to think of your artwork as a design element that works within the grid or layout of where it’s to be displayed. It seems obvious to hang framed artwork at eye-level, when it will be viewed by someone who is standing – but consider hanging it lower when in a place where someone would view it from a seated position, such as in a dining room or home office. Consider the sight lines when displaying artwork over a mantle, such as the view when seated or from across a room with pendent lighting that might impede the view. It’s notable that the triptych artwork is not overly tall within the space over the mantle, to better accommodate the overall interior design. The lighter framing allows the cooler black and white photography to really pop in contrast, drawing your eye to the artwork. When hanging art above furnishings, it is a good idea to keep the framed art in close proximity to the piece so that the multiple elements work as a single unit. If the piece is small, and looks too low over a console, hang it higher and edit the space with accessories. Small pieces of art can easily go unnoticed in a large room. Look for larger pieces that are in balance with the overall size of the room, as well as with the furniture in the space. Your choice of art can greatly add character so have fun curating art to express your style! 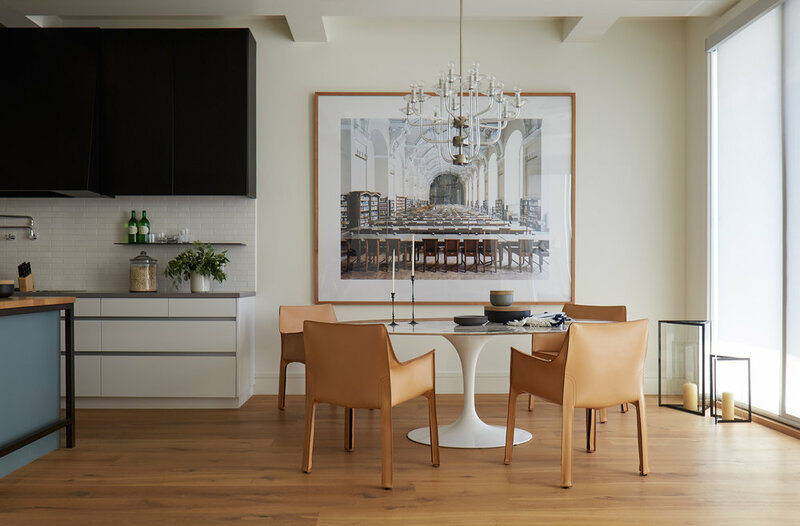 Photography CATHERINE KWONG DESIGN | create a stylish sanctuary for beautiful living. Wouldn’t it be ideal if your photographic art told a story, or just drew you in… The larger scale and intimate view of this photograph is notable as the framed art is hung at eye level though balances well for viewers either sitting or standing in the space. Quite versatile! Love how the framed art doesn’t overwhelm the space yet perfectly adds a little California Cool, by design. ART: Art has a major role in defining a space and can significantly convey a Client’s personality and signature style. Art can also truly express your story, life’s journey, and personal interests. FRAMING: Once a Client selects the art they love, the style of the custom frame acts as a bridge connecting it to the room. DISPLAY: Styling in an unexpected way can create drama as well as fully take advantage of the space one has. Creative display can customize an interior by showcasing a Client’s favorite art and treasures for more distinctive design. More highlights on all of my TOP 10 ARTFUL DISPLAY TIPS coming soon! Sign Up for Inspiration in your in-box and receive our expert TOP 10 ARTFUL DISPLAY Tips, free! Thank you for following EurDesign Studio!